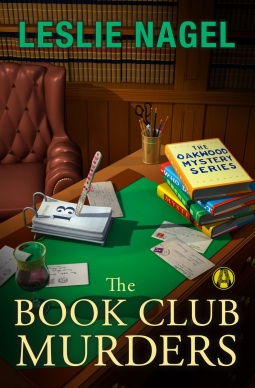 Charley Carpenter owns a successful consignment shop in her hometown of Oakwood, and one of the small ways she's made it successful is by letting her friend Frankie Bright lure her into a book club with Oakland society's elite ladies. She really likes only a few members of the Agathas, but she does enjoy books, and it has been great for business. Then Serena Wyndham, sister of fellow Agatha member Lindy Taylor, is found dead, and it's a scene right out of one of their murder mysteries. The investigating detective is her old crush and nemesis Marcus Trenault, now a police detective on their local police force. The two of them are both attracted to and exasperated by each other, but as one socially prominent society lady after another dies, all but Serena actually members of the Agathas, they can't avoid each other. It gets even harder when it's clear that all the murder methods are taken straight from murder mysteries the club has read in recent months. It's a nicely intricate story, it keeps moving, and the character development is decent. There are points at which both Charley and Marc seem to miss the obvious, but on the other hand, the relationship between them proceeds as if they are two intelligent adults and not fools who believe the worst about the supposed beloved at the least excuse. Supporting characters are good, too, bringing variety and personality to Charley and Marc's environment. Marc's partner Paul, Charley's business neighbor Dmitri the hairdresser, and the other members of the Agathas are interesting in their own right.